Đạo Hòa Hảo (Vietnamese: [ɗâːwˀ hwàː hâːw] ( listen), Chữ Nôm: 道和好), also Hoahaoism, is a lay-Buddhist organization, founded in 1939 by Huỳnh Phú Sổ (Popularly called Phật thầy, "Buddha Master" in Vietnamese), a native of the Mekong River Delta region of southern Vietnam. Adherents consider Sổ to be a prophet, and Hòa Hảo a continuation of a 19th-century Buddhist ministry known as Bửu Sơn Kỳ Hương (Sino-Vietnamese 寶山奇香). The founders of these traditions are regarded by Hòa Hảo followers as living Buddhas—destined to save mankind from suffering and to protect the Vietnamese nation. Hòa Hảo claims approximately two million followers throughout Vietnam; in some provinces near its Delta birthplace, as many as 90 percent of the population practice this tradition. An important characteristic of this movement is its emphasis on peasant farmers, exemplified by the old slogan, "Practicing Buddhism While Farming Your Land". Hòa Hảo stresses the practice of Buddhism by lay people in the home, rather than focusing primarily on temple worship and ordination. Aid to the poor is favored over pagoda-building or expensive rituals; religious and social ceremonies are ideally simple and modest, and are not to include the food offerings, divination services, and elaborate wedding and funeral customs found in some manifestations of Southeast Asian life. These are viewed as a waste of money which would be better spent helping the needy. In Hòa Hảo homes, a plain brown cloth serves as an altar, at which the family prays morning and night. Separate altars are used to honor ancestors and the sacred directions. Only fresh water, flowers, and incense are used in worship; no bells or gongs accompany prayers. A believer away from home at prayer times faces west (i.e., toward India) to pray to the Buddha. Adherents are expected to attend communal services on the 1st and 15th of each lunar month and on other Buddhist holy days. Huỳnh Phú Sổ faced a great deal of trouble when he began to spread the ideas of his religion, a large part of which was Vietnamese nationalism, a dangerous idea in that time of French colonial rule. He was put in an asylum because of his preaching, but supposedly converted his doctor to the Hòa Hảo belief. As the popularity of Hòa Hảo grew, Huỳnh Phú Sổ made a series of prophecies about the political future of Vietnam. He said that the "true king" would return to lead Vietnam to freedom and prosperity, which caused most Hòa Hảo to support the Nguyễn pretender: Marquis Cường Để, living abroad in Japan. During World War II, the Hòa Hảo supported the Japanese occupation and planned for Cường Để to become Emperor of Vietnam. However, this never happened and the Hòa Hảo came into conflict with the communists both because the Việt Minh were anti-Japanese and because of their Marxist opposition to all religion. 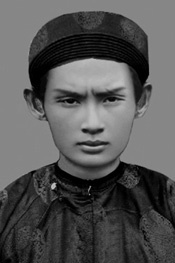 During the State of Vietnam (1949–1955), they made arrangements with the Head of State Bảo Đại, much like those made by the Cao Đài religion and the Bình Xuyên gang, which were in control of their own affairs in return for their nominal support of the Bảo Đại regime. In fact, the control of this government by France meant that most Hòa Hảo opposed it. During the early years of the Vietnam War in the 1960s, An Giang Province and its capital Long Xuyên were among the few places in the Mekong Delta where Viet Cong activity was minimal and American and South Vietnamese troops could move without fear of sniper attack. After the war, the Hòa Hảo were allowed to remain, but like all religions, under strict Communist control. The Buu Son Ky Huong religion was described by its adherents as "committed to the world". The basis of the Buu Son Ky Huong religion was the Buddha Master's claim to be a messenger from Heaven who had come into the world to warn mankind of the imminence of apocalypse. The key to this cult was simplicity, flexibility, and frugality. No one could plead lack of means or difficult circumstances as a justification for not carrying out his own religious duties and for relying instead on monks, but these duties were kept to a minimum. The Buddha Master's advocacy of ritual frugality probably attracted many poor peasants by allowing them to turn practical necessity into religious virtue. Because of the overwhelmingly domestic nature of the cult, the French observer Georges Coulet called it in 1926 the " Third Buddhist Order, " explaining that it was neither monastic nor congregational but mostly lay. However, he observed, there were days when adepts were expected to gather in pagodas that belonged to the sect: " This cult is sensibly a Buddhist cult. It consists of the observance of fasts and abstinences, of the daily recitation of prayers, of invocations which must be said at certain hours of the day or night: it imposes visits to mountain pagodas on the fifteenth day of the first, seventh, and tenth months of the Annamite year. Fasts and abstinences can be once a month, once every two months, once a week, once every two weeks, or perpetual . . . Offices are celebrated thrice a day: at dawn, noon, and dusk. At these times, candles are lit on the altar, and joss-sticks are placed in the incense-burner; the caretaker of the temple gives several strokes of the bell and the faithful perform several prostrations in front of the altar, bowing their heads to the ground. Prayers are said in low voice; a few beads are recited. Finally, in exchange for a contribution in money or goods, amulets are distributed by a monk of the pagoda; these amulets preserve from death, illness, and misfortune. The founder of the Hoa Hao was Huynh Phu So, who took for the name of his sect the village of Hoa Hao, in the Thot Not District of what is now An Giang Province. So's background is not completely known; but most authorities agree that he was a mystic who saw a vision instructing him to launch a new religion. He organised his sect in 1930, declared himself a prophet, and began to preach a doctrine based on simplicity and faith. Within a year, he had gathered a following of over 100,000 converts; and through his preaching, he established contact with another two million people in the Mien Tay region. While Huynh Phu So is regarded by most commentators as a traditionalist, and indeed many of his teachings support such an interpretation, he also had a well-defined modernizing vision, evident, for example in his imprecation against superstition. No Vietnamese leader of the time possessed personal charisma to quite the same degree as Huynh Phu So. A measure of Huynh Phu So's powers of persuasion is that he made his mark as a healer despite his own well-publicised ill-health. Throughout his career, healing remained an important feature of his work; a substantial number of pamphlets describing the herbal remedies employed by Huynh Phu So still exist. So divided diseases into two categories: those that were the result of ordinary ill-fortune, and those that were the result of karmic retribution. The latter was not amenable to treatment; only repentance could alleviate it. Each of these new recruits were people of little education, interested in action rather than in doctrinal or political questions. They put themselves entirely at the service of Huynh Phu So. By August 1940, the Can Tho authorities were alarmed by their activities and by the destabilizing influence of Huynh Phu So. He was summoned for a psychiatric examination at Can Tho hospital. Huynh Phu So was taken to Cho Quan hospital in Cho Lon and put under the care of a Vietnamese doctor named Nguyen van Tam. The latter's verdict was more charitable: "This monk has never presented signs of agitation or insanity. He is mentally weak, with a disharmony of the intellectual faculties." In spite of being considered "mentally weak," So converted several of the hospital wardens and, more important, his own doctor. For a man who had never had any qualms about being called the Mad Monk, this was a resounding triumph which the sect exploited to the full. The doctor became a devoted follower of Huynh Phu So, until he was assassinated by the Viet Minh in 1948. In May 1945 Huynh Phu So issued a pamphlet called "Guidelines for the Practice of Religion" (Ton Chi Hanh Dao), in which he codified Hoa Hao cultic practices and for the first time imposed rules on admission into the sect. His adepts were exhorted to uphold the Three Bonds: between ruler and subject (transmuted into patriotism), father and son, and husband and wife. They were to observe the Five Virtues of benevolence, loyalty, propriety, intelligence, and integrity. Above all, they were to live in accord with one another. Whatever the usefulness of such a code of ethics in a modern, industrial society, it was quite effective within the confines of the average Hoa Hao village. Among themselves, the adepts relied on trust and did not bother to put doors on their houses to guard their belongings. Hoa Hao religion combines the two kinds of Buddhism into one orientation: prescribing that all should strive to become monks for life but doing so at home and supporting themselves rather than turning into a caste of specialists permanently dependent on the community. The proscription on displaying Buddha statues on the household altar is borrowed from Islam’s proscription on the worship of images. The presence of a significant Islamic community in the local area has an impact on the Hoa Hao religion. A large community of ethnic Cham converts to Islam live in close proximity to Hoa Hao village. The surrounding area is full of mosques and its residents number many devout Muslims. Huynh Phu So, the founder of the Hoa Hao went to school in Tan Chau, in a heavily Muslim area. The influences are evident in the Hoa Hao’s religious practices; doctrine and architecture; the approach to prayer and preaching houses. A number of the towers, such as the one located by the Mekong River in Tan Chau town, have ornate sculpted decorations in an Islamic style and domed roofs. The Hoa Hao religion has been open to a range of different influences, including Marxism and US-style modernization ideology. For example, the combination of nationalist sentiments with the cult of heroes, the concept of a supreme being and US civic religion is found in this statement made by a contributor to a Hoa Hao Buddhist journal in the USA on the prospects for the democratization of Vietnam: I am praying to a higher power and to the sacred soul of the land, to the souls of heroes who have fallen on behalf of their beliefs and for the defense of the nation, so that they can prod and move and defeat this wave of atheism which is currently washing over Vietnam so that our people can welcome the light of Freedom and Democracy. The sect expanded rapidly under Japanese protection. Even though Huynh Phu So was unable to leave Saigon, his apostles recruited on his behalf, using the familiar mixture of doom-laden predictions and veiled threats against those who did not join and distributing cures and amulets. By 1943, the Hoa Hao sect was thus moving in the direction of greater institutionalization. The death of Huynh Phu So thus marked the end of the Hoa Hao millenarianism and the beginning of purely communal politics. Within the Hoa Hao communities, the preachers of old were replaced by lay administrators who were elected and unpaid. Healing was now the province of a health service operated free of charge by the sect. Evangelizing took the form of religious and academic education. The sect opened schools at all levels, and in the early 1970s it even established a university. Western technology in fact provided the sect with a new tool of mass indoctrination when the focus of Hoa Hao village life, the reading-room, was connected to a public-address system. The sayings of Patriarch Huynh were thus broadcast daily over loudspeakers. Charity also became organized: the sect offered relief for veterans and prisoners, for victims of floods and fire, for old people and orphans. Life in Hoa Hao villages continued to be led along simple lines. The adepts were guided by Huynh Phu So's teachings concerning cultic practices and daily conduct, and they kept the number of ceremonies low and the expenses connected with them minimal. Neither adepts nor leaders were particularly interested any longer in promoting radical change or even in pursuing the violent expansion of the sect. Their energies were now devoted to the preservation of the communitarian style of life which was the other Buu Son Ky Huong ideal. But communitarianism proved ill-suited to the social complexities of an urban environment. Furthermore, the adepts are virtually leaderless. The establishment of the sectarian infrastructure helped preserve their cohesion, but the corollary de-emphasis on charisma made it harder to mobilize the collectivity of the adepts into action. The Hoa Hao works images of globes into their iconography which is an aesthetic expression of universalism reflecting an imagining of the spatial condition as global. This symbol has a mnemonic function as one of the four injunctions of the Hoa Hao faith is to recognize one’s debt to humanity. Yet it is also a reminder to followers that the propagation of the Hoa Hao faith is considered a sacred mission in order to reform mankind. This value is also reinforced in the prescribed color for the altar cloth and flag, which is brown. As brown is considered the combination of all colors, it is used to symbolize human harmony and the connectedness and interdependence of all people. Hoa Hao Buddhism is generally considered an apocalyptic religion: believers are held to anticipate the impending destruction of the world and seek refuge provided by faith. This illuminates the history of violence in which the Hoa Hao have been involved. Of a less revolutionary order of activity, members of the faith are also very active in health care provision, community development activities and philanthropy. Such activities in accordance with the Master’s injunction to social engagement represent a viable and promising basis for the Hoa Hao to secure broader political support. Although Hòa Hảo Buddhism is an officially recognized religion in Vietnam, many members refuse the forceful governmental affiliation which is entailed by official recognition[clarification needed] and an unknown number of religious leaders have been detained for this reason. Two Hòa Hảo Buddhists self-immolated in 2005 to protest against religious persecution and more recently, after a wave of arrests of Hòa Hảo Buddhists, nine more were imprisoned in May 2007. Hòa Hảoists reportedly do not believe their founder died under torture. They surmise that he is still among the living. In 2007, the Vietnamese government had the printed prophesies of the founder seized and reprinted to a volume slightly more than half the original size. The ceremonies commemorating the birth of this prophet were outlawed. Since then, Hòa Hảo split into two factions – more and less militant. Some Hòa Hảo adherents migrated to the United States. The largest number of Hòa Hảo-ists live in Santa Ana, California, USA. Hoa Hao Buddhism draws upon an earlier Buddhist millenarian movement called Bửu Sơn Kỳ Hương and reveres Đoàn Minh Huyên (Nov. 14th, 1807 - Sept 10, 1856) who started the movement as a living, healing Buddha. He is referred to as Phật Thầy Tây An or "Buddha Master of the Western Peace". However, the founder of Hoa Hao Buddhism, Huynh Phu So, also organized Hoa Hao teachings into a more structured movement focused on self-cultivation, filial piety and reverence toward the Three Treasures of Buddhism (the Buddha, the Dharma and the Sangha). As a lay-Buddhist organization primarily focused on Vietnamese peasants, it also eschews elaborate Buddhist rituals, maintains no monastic order, and teaches home practice. ^ a b c d Ho Tai. MILLENARIANISM AND PEASANT POLITICS IN VIETNAM. Harvard University Press. ^ a b c d Haseman (1976). "The Hoa Hao: A Half-Century of Conflict". ^ a b c d e f g Taylor. "Apocalypse Now? Hoa Hao Buddhism Emerging from the Shadows of War". ^ "UNPO: Montagnards, Khmer Krom: Religious Intolerance Rewarded by UN". www.unpo.org. Archived from the original on 5 March 2017. Retrieved 6 May 2018. ^ Dutton, George E.; Werner, Jayne S.; Whitmore, John K., eds. (2012). Sources of Vietnamese Tradition. Columbia University Press. p. 438. ISBN 0231511108. John B. Haseman. "The Hoa Hao: A Half-Century of Conflict",Asian Affairs, Vol. 3, No. 6, 373-383. This page was last edited on 21 March 2019, at 07:17 (UTC).